Even though Google failed at finding a market for its smart glasses, companies are still creating a variety of different wearable devices that look more like traditional glasses rather than something worn by a cyborg. One such innovative range of smart glasses has been created by Vue and are indistinguishable from a traditional pair of normal spectacles. Although hidden behind the frames is a wealth of features and technology to make your life even easier. Watch the promotional video below to learn more about the Vue smart glasses and their integrated technology which is capable of gesture control, navigation and more. Vue frames come with integrated technology, meaning your glasses will be able to do more than meets the eye. We’re partnering with an FDA-certified lens manufacturer to provide you with the lenses you need. You’ll have the choice of prescription (including progressive), photochromatic transitioning, polarized, and prescription polarized lenses. We’ve all been there—sometimes the universe just swallows up our glasses. 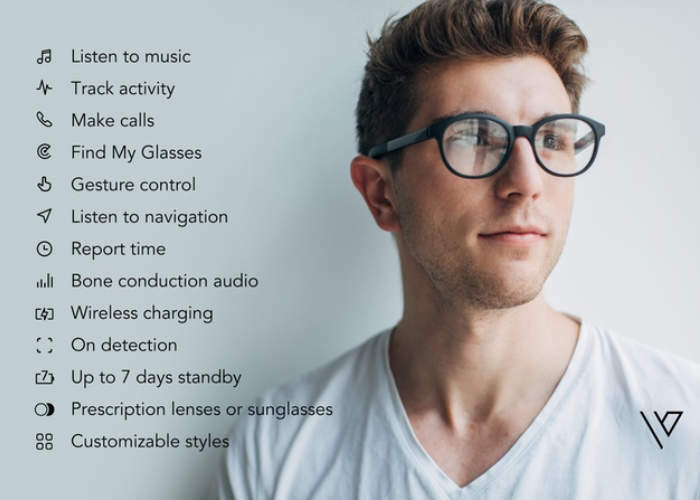 With the Find My Glasses feature, you can relax knowing that you’ll be able to find your frames again.Vue uses bone conduction audio technology to transfer stereo sound to your inner ear without the use of earbuds. Your ears remain unplugged, so you can listen to music, answer calls, and hear notifications all from your glasses while still being able to hear the world around you. For more information on the Vue smart glasses jump over to the Kickstarter website for full specifications and the ability to make a pledge from $159 for earlybird backers providing over a 40 percent saving off the recommended retail price of $269.